"Relax". "Smalltown Boy". "Male Stripper". There had been quite a few hit songs in the '80s that dealt with the lives and loves of gay men, but not so many - possibly none? - about lesbian relationships. That changed this week in 1992, when the debut single by an American artist who describes herself as omnisexual arrived on the ARIA singles chart. Although I did not realise until this very moment that it was written about one woman's feelings for another. At the top of the chart this week in 1992, a group of five young women ascended to number 1. "Take It From Me" by Girlfriend began a two-week stint as the country's best-selling single. They continued releasing music into 1995, but this uncharacteristically brash lead single from second album Psychohum was the last one to feature on the top 100 for Falling Joys. Molly Meldrum's latest musical project made an understated debut with this new jack swing-lite single, which he co-wrote with the PWL B-team, Phil Harding and Ian Curnow. In a couple of years' time, they'd have one of the biggest hits of the grunge era, but for now, Soundgarden slipped into the top 100 with this single from Badmotorfinger. In the US, this charted as a double A-side with "Human Touch", but in Australia, this track from Bruce Springsteen's other current album, Lucky Town, went it alone. Previous release "Where Do You Go" had been pretty much what you'd expect from the Hunters, but this next single from upcoming album Cut gave a good indication of their new musical direction. 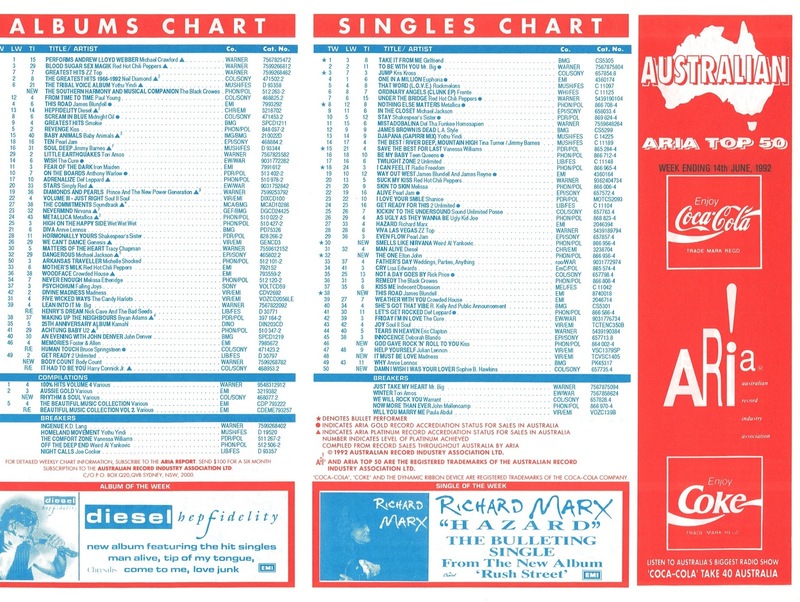 Back in December, Australia had broken away from Paula Abdul's US release schedule by opting to go with "Vibeology" (which reached number 63) instead of "Blowing Kisses In The Wind" (which missed the top 100 when it was eventually released earlier in 1992). For the fifth single from Spellbound, we fell back in line with America and went with "Will You Marry Me? ", which returned Paula to the top 100 (and almost the top 50), no doubt picking up some interest due to the fact the singer had actually just got married - to Emilio Estevez. Like "Again Tonight", the third single from John Mellencamp's Whenever We Wanted album feels familiar, but perhaps it's just its back-to-basics rock sound. I really don't have anything else to say about "Now More Than Ever" other than there are some cute scenes of kids dancing in the music video. 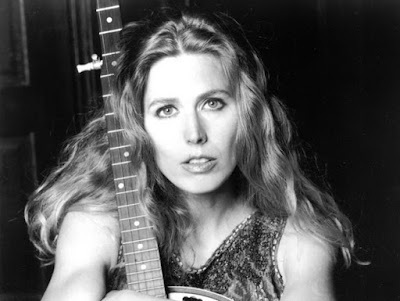 And here I was thinking the only revolutionary thing about the debut single for singer/songwriter Sophie B Hawkins was that it had the word "damn" in its title. Turns out, the song is from the perspective of a woman who sees the object of her desire - another woman - in an abusive relationship. Shows how much attention I pay to lyrics. But then again, I don't think I was the only one to miss the meaning of the song, since any stir there was about "Damn I Wish I Was Your Lover" actually related to its initial video, which was rejected by MTV for being too racy. A top 10 hit in Australia and the UK, it was a great start to Sophie's career, but it would be another three years before she'd be back on the top 50 - with another song that peaked at number 7. It'd been Madness's first massive Australian hit in early 1982 and their eighth consecutive top 10 single back home in the UK. A decade on, "It Must Be Love" was re-released to support the band's greatest hits collection, Divine Madness, which was the first compilation (and there had already been quite a few) to include all 22 of their singles - in chronological order (just how it should be). 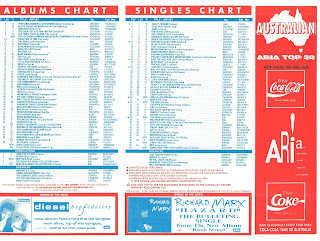 A cover of a 1971 song by Labi Siffre (which reached number 46 in Australia), "It Must Be Love" only grazed the ARIA top 50 this time around, but in the UK, where re-releases, remixes and re-recordings of old songs to promote new best ofs was commonplace, the song returned to the top 10. Here's another song that was first recorded back in 1971 (although not released by Argent until 1973), and covered by both Christian rockers Petra (twice) and British band The Truth before KISS had a go at it. Included on the soundtrack to Bill And Ted's Bogus Journey, the slightly renamed "God Gave Rock 'n' Roll To You II" gave the band their most successful single in Australia since their 1980 heyday and the number 5 peak of "Shandi". What a good move that collaboration with James Reyne had been. "Way Out West", which fell out of the top 10 this week, had ignited huge mainstream interest in country star James Blundell, so much so that his album This Road had debuted in the top 5 in May. And now, the title track gave him his first - and, as it would turn out, last - solo hit single. Since the arrival of his debut album, Elton John had kept up a remarkably consistent release schedule - issuing at least one studio album nearly every year between 1969 and 1989 (the exceptions: 1977 and 1987, when a compilation and live album respectively kept things ticking along). And so the gap between 1989's Sleeping With The Past and 1992's The One was longer than Elton had ever left before. The reason for the break was down to the music legend having checked himself into rehab in 1990 after years of drugs and debauchery. His musical return, however, was pretty much business as usual, with The One's lead single and title track about as typical an Elton John ballad as you could hope for - and another top 20 hit to add to the 27 he'd already achieved. His previous visits to the Australian chart had been with parodies of Michael Jackson and Madonna songs, but in 1992, despite recent releases by both superstars to poke fun at, "Weird Al" Yankovic turned his attention to music's newest big thing: grunge. Actually, he was going to send up "Black Or White", but his attempt, "Snack All Night", was, for once, not something Michael was thrilled by, given the more serious subject matter of the source material. And so, "Weird Al" made fun of the fact that Nirvana singer Kurt Cobain is almost incomprehensible on "Smells Like Teen Spirit" and released his spoof with a music video that showed the comedian's typical attention to detail. The parody restored Al to the chart, following the complete failure of his previous project, the movie UHF and its soundtrack. It would, however, be his last visit to the ARIA top 50. Next week: a music megastar breaks his musical silence, plus the dawn of the modern era of Disney theme tunes. This was a good week for me in 1992. Weird Al was back in the charts! His album "Off The Deep End" was one of the first CDs I bought (and I got him to sign it 19 years later). When I got the album I was puzzled as to why "Waffle King", the 'B-side' of the "Smells Like Nirvana" single wasn't on there. I found out later it got swapped with a song planned for his next album which contained the line "I really love you...not!" and he wanted to release it in 1992 when that type of humour was still current. I had to laugh a few years back when on a Home & Away early years repeat, Adam was playing this Peter Andre song on a ghetto blaster down a payphone. I can't remember the details, but think it was for a radio competition. 'Will You Marry Me?' was another single that was available with a bonus VHS, which may have helped it to reach the giddy heights of the top 60. I thought what Hunters & Collectors were trying to do with this album was similar in some ways to Transvision Vamp's third album - melding guitar-based music with dance beats. I can think of several songs from the 80s that are presumably about lesbian relationships, but none of them were as overtly so as 'Damn...' with its "making love to her" line. Sophie is wearing some rather unfortunate briefs in the first video that look like a nappy. I discovered via a rage special airing around this time that I was familiar with several Madness songs, but never knew who they were by until this re-release. It's odd that ARIA list it as a new entry rather than a re-entry. It's interesting the Kiss single took so long to get released/become a hit here, since drummer Eric Carr (who appears in the video) had died the previous November. A parody of Nirvana was just what was needed by mid '92.